the camera did its own thing…or did it? This week’s photo must be attributed to my son – the aspiring film maker and out-of-the-box thinker (takes after mom). Last year, he took a photography class and had access to some very sophisticated (and expensive) film equipment. He took many pictures and many of them have been posted on my blog and featured in other weekly challenges. The photo above was a complete mistake. Jordan liked the view of the lake and was hoping the guy on the cell phone would move – he did not. 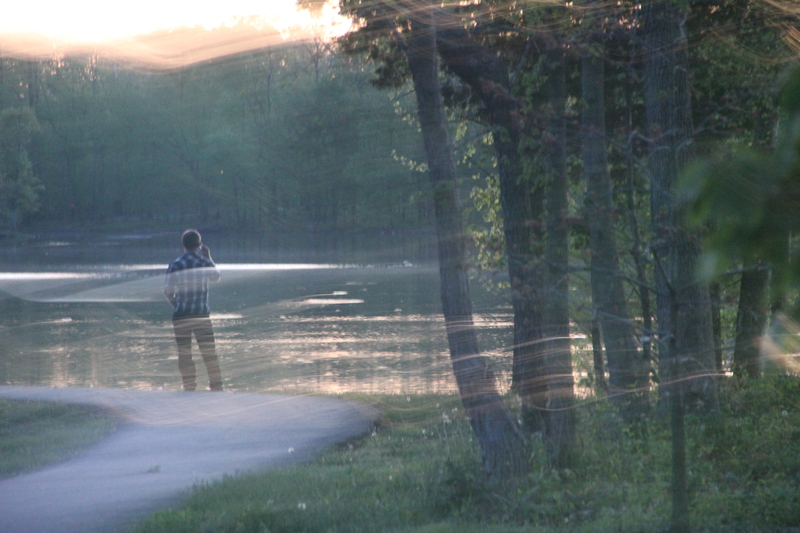 He decided to take the photo as is, due to the serenity of the shot and the relationship to the person on the phone. Somehow, someway Jordan took this photograph. Word has it, he got a bit freaked out – thinking he caught a moment where the spirits were passing by…. Lucky for us, he did not scrap the photo! Entry filed under: Daily Post, Personal, photo prompt, photography, prompt, The Daily Post, Weekly Photo Challenge. Tags: inspiration, nature, observations, outdoors. Wow love it! That creates such an eerie feeling! That’s a fabulous photo indeed!! What a cool feel to this photo! Thank you so much:) I will pass your words on to the kid!